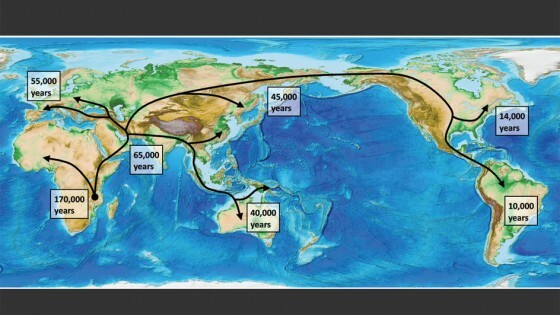 Diagram showing spread of humans from Africa. Credit: Andrea Manica. Research indicates the out-of-Africa spread of humans was dictated by the appearance of favourable climatic windows. By integrating genetics with high resolution historical climate reconstructions, scientists have been able to predict the timing and routes taken by modern humans during their expansion out of Africa. Their research reveals that the spread of humans out of Africa was dictated by climate, with their entry into Europe possibly delayed by competition with Neanderthals. The research is published in the journal PNAS. Dr Anders Eriksson, from the University of Cambridge, the lead author of the paper said: "By combining extensive genetic information with climate and vegetation models, we were able to build the most detailed reconstruction of human history so far." The role of climate change in determining the timing of the expansion of human populations has been long debated. The oldest fossil remains of anatomically modern humans are found in Africa and date back to around 200 thousand years ago, but there is no trace outside Africa until 100 thousand years later. The newly published model provides the first direct link between climate change and the timing of the expansion out of Africa, as well as the routes taken. To investigate the role of climate, the Cambridge scientists built a highly detailed model tracking the fate of all individuals on the planet. The project involved specialists from a variety of fields. Working together with climatologists and vegetation modellers, they reconstructed climate and sea level changes and their effect on food availability through time, with a resolution of 100km. After exploring several million demographic scenarios (e.g. birth rates, local movement rates, link between food availability and population sizes), they were able to identify the scenarios that were most compatible with the geographic patterns of genetic diversity in modern humans. Working with anthropologists and archaeologists, they were then able to compare these scenarios against the dates and localities of known archaeological and fossil finds. The demographic scenarios chosen by the model revealed a link between food availability and population density in the past was very similar to the link found in present day hunter-gatherers. Based on this link, the model found that climate prevented humans from exiting Africa until a favourable window appeared in North-East Africa approximately 70-55k years ago. Most movement occurred through the so-called Sothern Route, exiting Africa via the Bab-el-Mandeb strait into the Arabian Peninsula. The dating of the out-of-Africa exit as well as the arrival times for other continents identified by the model, were also found to largely agree with archaeological and fossil evidence, with the notable exception of Europe. For Europe, the model based on climate predicted arrival times approximately 10 thousand years earlier than the available archaeological evidence. This discrepancy could be explained by competition with Neanderthals, which was not accounted for in their model, and would likely have slowed down the colonization of Europe by modern humans. Dr Manica, who co-led the study, said: "The idea that we can reconstruct climate, and estimate food availability and finally figure out the demographic changes and movements of our ancestors all over the world is simply amazing. The fact that most of our results are in agreement with archaeological and anthropological evidence – which was not used to generate our model – points to the fact that our reconstructions based on genetics are quite realistic."